Tagline: Don't miss the only film where the heroes get wiped out in the first five minutes! 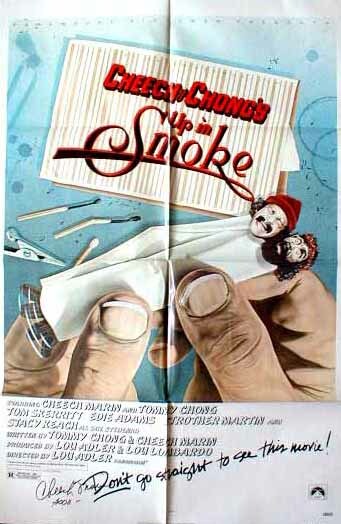 The Story:Two directionless musicans, a Chicano guitarist (Cheech Marin) and a White drummer (Tommy Chong), meet up in a chance encounter and embark on a series of odd adventures, including being the unwitting partcipants of a bizarre marijuana smuggling plot. They go in search of some dope and are accidentally deported to Mexico where in their desperation to get home they agree to drive a van back to the States so they can get back in time for a gig they are due to play. Unaware of the properties from which the van is constructed they make their way back having aquired a couple of female hitch-hikers whilst all the time avoiding the cops whom they are not even aware are following them. 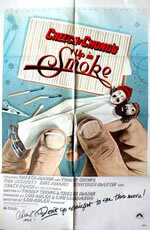 Up in Smoke is the first of the Cheech and Chong movies and probably the best overal.